Since the self service ad platform in 2013, twitter has developed a range of products to help small scale businesses achieve their marketing goals. Twitter is putting a lot of focus on expanding and monetizing its ad platform and a couple of days ago it launched the “Quick Promote” feature. What is this quick promote? When you register your business with twitter, it gives you your own Twitter analytics dashboard and here you can pick up the best performing tweets and have them targeted to an audience that is most likely to be interested in what you are trying to put forward. The process is quick, twitter has claimed and that is one of the reasons it is called so. And it is fast, in two clicks you can reach out to a high quality audience on twitter in a very simple way. However there is a drawback in the form of the very advantage. It could prohibit reach because it only allows you to reach the lookalike audience. For the variety it still is not clear. For the advanced audience targeting you still have to visit twitter’s full ad service platform. Earlier advertisers could only promote tweets using the bespoke ad platform. This has most certainly brought in ease of advertisement and because the service targets SMB’s it is an added advantage for more business for twitter too. In a blog post, twitter launched this service and revealed the how to of the whole procedure. 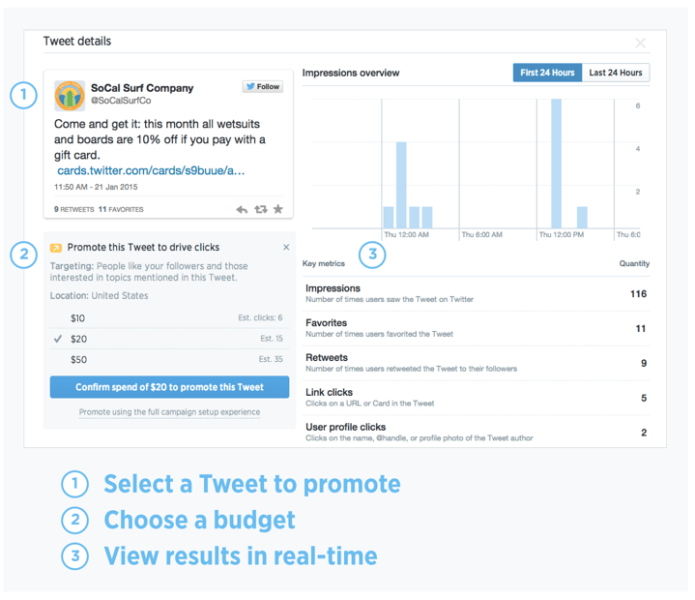 “Here’s how to get started with quick promote once you’re logged into your Tweet activity dashboard.